It would be true to say that Cicero, philosopher and lawyer, didn’t know what hit him. He tried to throw a couple of rocks but he flailed as Terni the Dragon came hurtling from the sky. "Dragon One to Wabbit. I have Cicero on visual. Over." Terni dived straight at Cicero and feinted right, spiralled up, then made another pass. "He’s out of rocks, shall I apprehend him?" 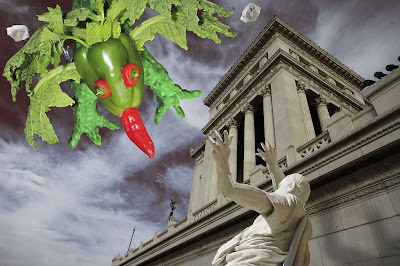 Terni’s radio crackled and the Wabbit spoke. "What do you mean he’s out of socks?" "Your radio need new batteries, Commander," said Terni. "Detain him until our arrival," said the Wabbit. "How long will you be?" said Dragon. The radio coughed and spluttered but Terni couldn’t hear a word. "I’ll have to keep Cicero talking," thought Terni and he swooped down. Cicero trembled. "Are you going to eat me?" Terni fluttered his cabbage wings. "I’m vegetarian," he said. "Are you then in league with the rabbits?" "What league are we talking about?" said Terni. "They took my stone," said Cicero and they will use it for evil beyond belief." "I don’t like the sound of that one bit," said Terni, "but since we’re here and we have to wait, fill me in." "I am not ashamed to confess I am ignorant of what I do not know," said Cicero. "Yet I do know this. They are large and strong and chatter with terrible teeth." I’ve heard the Commander speak of them," said Terni. "The Commander?" asked Cicero. "The Commander will help you get your stone," said Terni. "Why?" said Cicero. "He gets bored," smiled Terni.